Because Dev Saab sang these words. Yes, I actually thought that it was that tall, not so dark but very handsome and charming young man in a dark suit with a champagne glass in his hand, smiling and flirting away as he sang these lines to further say Chheda mere dil ne taraane tere pyaar ka in the film Asli Naqli. I didn’t know at that time that the man who actually put his heart and soul into that song was a not very tall, not very fair and not your chocolate boy hero looking young man. He was, as I was to discover through some photographs in Filmfare, a stout, smiling but charming gentleman, whose eyes twinkled merrily in every picture that I saw of his. He stood next to his car, he held a badminton racket in his hand in another picture. He lovingly sat talking to little kids in another picture. But in each picture one thing emerged clearly. He was a kind man. He was a gentle man. He was a gentleman. No wonder then, I concluded, that his voice was so clear, so clean so godly and so loving. At times I would wonder why he needed the help of so many musical instruments to assist him. Because, as I wrote in the title of this article itself, pyaar ka saaz literally flowed from his throat as the voice echoed what the heart said. Even if he just hummed, or yodeled, or lisped, it would still be sheer music. So many people who have sung alongside him, so many who have written songs for him to sing, so many who composed those magical numbers for him to mouth, and of course millions who have heard him have one common thing to say. “Woh dil se gaatey they”. Asha Bhosle has said this. So has Pyarelal Sharma said this. And so has even comedian Jagdeep said this. In fact he went on to add, “Woh dil ka baadshaah tha….uski awaaz dil se goonjti thi”. No wonder then, I confess, that his songs will always have that special place in people’s hearts, just as they have in mine. It is over 33 years that he left his body to join the heavenly stars up there, but why is it that each of his songs come across as so fresh, so powerfully credible and so superior to many decent songs composed in recent times only to be forgotten in less than a year? The answer lies in the sincerity, the integrity and the sheer labour of love that we in today’s times call Mindful Consciousness. Yes, spirituality oozes from Rafi Sahab’s songs. Each one of them. whether it is a patriotic number as Woh Bharat Desh Hai Mera, a children’s marvel as Nanhe Munne Bachhe teri mutthi main kya hai, a lover’s plaint as Tere Mere Sapne ab ek rang hain, or even a father’s sad song as Babul ki duvaayen leti jaa. Each song exemplifies that one single aspect of an artiste’s contribution. Let me call it Imaandari. Let me call it total devotion. Let me call it total surrender to God’s gift that Rafi Sahab would always say that he had been bestowed with. I agree it was God’s gift. But how many of us keep that gift with us with all sincerity and devotion? How many of us just fritter it away or just ignore it or don’t even recognize it? Rafi Sahab accepted that gift with humility, nurtured it with great care and love and presented it to his numerous fans as a sharing of God’s Gift. He was literally sharing with us the Prasad of all the worship, all the devotion and all the goodness God had showered on him. Not for a minute did he hesitate to give of his best, whether he was ruling as the baadshah of playback singing or whether he had been sidelined by small-minded composers and other artistes. He continued to share his gifts, partake of the same with no jealousy, no greed and no avarice. Which is exactly why his last song sounded as fresh as his first. The proof? Listen to him in Shaan, Abdullah and Dostana, all movies of the late 70s and early 1980, and you will get your answer. Rafi Sahab was on the rise when God called him up there to entertain the celestial audience. Anything I may want to write about him (I can do that for a 100 pages or for months on end) can be simply put in that one single song of his. Yaad kisiki jab aati ek naya geet ban jaata hai. Long live Rafi Sahab. May you continue to share your gifts with us and future generations. We shall never ever forget you, we just can’t. You remain as fresh as ever. Which is why you perhaps always said- Khushboo hoon main phool nahin hoon jo murjhaaonga. Jab jab mausam leharayega main aa jaoonga. The man for all seasons. Rafi Sahab. This entry was posted on Tuesday, December 24th, 2013 at 11:30 am	and is filed under Meri Awaaz Suno. You can follow any responses to this entry through the RSS 2.0 feed. You can leave a response, or trackback from your own site. Rafi sahab you had said several decades ago thru your song Tum mujeh yun bholana pau gey.How true it is today and it will be for centuries to come. Mohammad Rafi was and will be the only voice which gives me an inspiration to keep on living and enjoy every moment of life. When I am down, he picks me up with the joy and power in his voice. I listen to him every day of my life and thank God for bessing us all with the heavenly voice. Thank you so much for your warm and encouraging feedback. Tumhen bhool jayen ye mumkin nahin hai. Long live rafi sahib. Bahut hi pyari tahreer hai aap hai. Mubarak. An excellent write up. It is true that in the year 1980 Rafi Sahab has sung a number of hit songs. After his demise, he was also nominated for filmfare best male playback singer for three songs from the films Karz, Dostana and Abdullah.But who knows that God is planning to call him up. It was a shocking incident for all music lovers of this world. 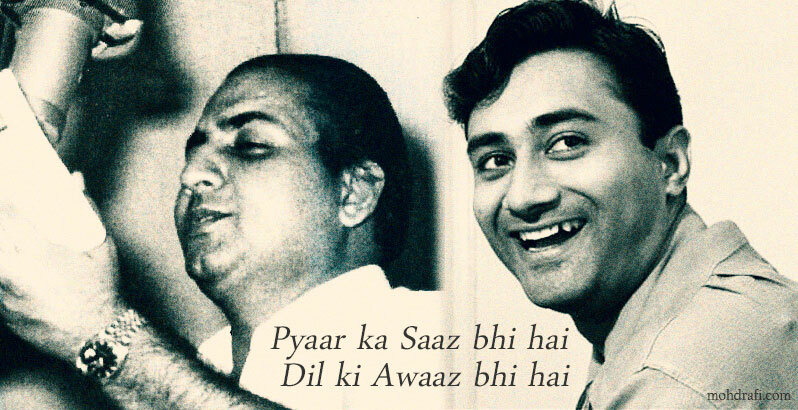 Our beloved Rafi Sahab is still living in the hearts of his fans. He will remain here for ever.